Wind Cave Nature Reserve (also known as Lubang Angin) provides visitors with an authentic, but relatively safe, caving experience in pitch black, bat-infested tunnels. 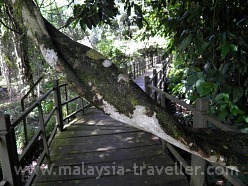 You can also see some of the 6.16 hectares of forest and rivers in the protected reserve surrounding the caves. 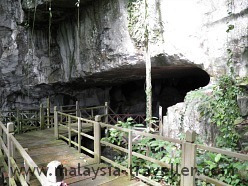 Wind Cave is located 5km from the former gold mining settlement of Bau and 48km from Kuching, Sarawak. 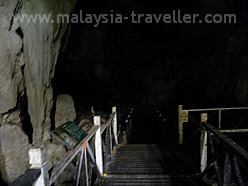 It is just a few minutes drive from another show cave, Fairy Cave, and most tourists would combine both on a half-day trip from Kuching. 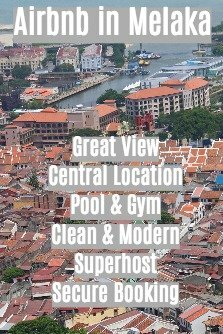 It is worth visiting both since they are very different experiences. Unlike Fairy Cave, which has a light filled cavernous main chamber, Wind Cave is made up of three unlit tubular passages. From the Customer Service Centre, where you register and pay, a concrete boardwalk leads up to the entrance of Passage No. 1. When I visited, a swarm of hyper-active wild bees was buzzing in the entrance but fortunately they did not bother me. 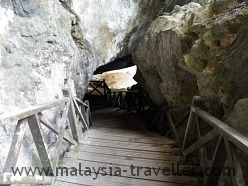 From here the 1000 metre long plank walk disappears into the gloomy interior of the cave. There is no lighting at all at Wind Cave (to avoid disturbing the bats) so after walking for a minute or two you are completely reliant on your torch, which is indispensible for this cave. Yellow reflective stickers line the route and there are railings on both sides of the path so you cannot fall off or get lost. Notice boards at periodic intervals provide information on the species living in the cave. 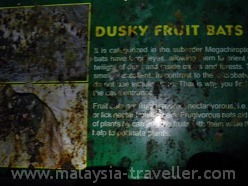 There is more than one species of bat here, including Dusky Fruit Bats. There are also colonies of swiftlets nesting in the roof of the passages. Deep in the heart of the cave, I switched off my torch for a minute or so to see what it would be like. Rarely have I experienced such complete, enveloping darkness with only the high-pitched squeals of bats for company. I don't know why they call it Wind Cave because there is not a breath of air in there except for the micro breezes of millions of flapping bat wings. 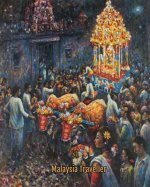 Admission is RM 5 for non-Malaysian adults and RM 1 for Malaysians. 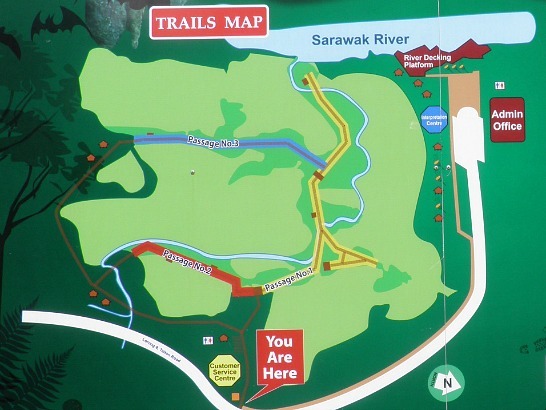 The approximate location of Wind Cave is marked on the map on my Top Sarawak Attractions page. 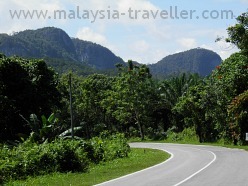 About 5km after Bau you will see a turn off to the right marked Wind Cave (Lubang Angin). The entrance is 300m from the turn off. Journey time from Kuching is about 45 minutes. Wear sturdy footwear with good grips as some of the paths are slippery, especially outside the cave. Wear a hat unless you think bat droppings are good for your hair. Wear an effective insect repellent. Personally I wear long sleeves and long trousers too. Gloves are not a bad idea as the hand rails in the cave are guano encrusted. Bring some drinking water. It's really hot and humid inside. Thirty minutes inside the cave is probably more than enough for most people. Don't forget the torch! The headlamp sort is preferable. If you are travelling alone (like I was) it is worth taking a spare torch in case the batteries run out.